Palm Harbor, Florida is a small town on the west coast of the state, situated on the Gulf of Mexico. It is a popular town for tourists to visit. Palm Harbor is unique in the fact that it has higher elevations then many towns or cities in the state of Florida, with some being close to eighty feet above sea level. 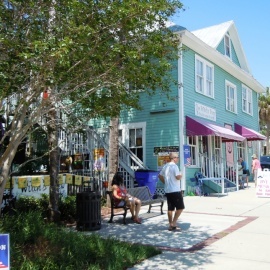 Business in Palm Harbor is made up of a variety of retail industries. It is convenient to travel to and from the area because it is only thirty minutes from an international airport and very close to a major deep water port. The history of Palm harbor began with people starting to occupy the area around 1860. Most settlers to the area worked as farmers. Citrus played a big part of the farming business and is still grown in the Palm Harbor area. Fishing was also a sought after business due to the Gulf of Mexico being so close. Tourists will find that some of the mineral springs that made Palm Harbor popular in the early 1900's are still in existence. There are many resorts, nearby beaches and nature parks to see while visiting the are of Palm Harbor, Florida. The historic downtown area is still a bustling place with many shops offering antiques and souvenirs. Dining possibilities are limitless as are very nice hotel accommodations. There are also Bed and Breakfasts along with rental beach-front cottages in the area of Palm Harbor , Florida. The Thirsty Marlin in Largo and Palm Harbor | Fresh Seafood and More!